Vacation is coming. The end of everything is coming too. My tutor session has finally come to an end at this noon. 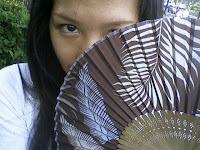 Out of surprise, she gave me this folded fan. I didn't know that we have to make it this memorable. But anyway, she did it and I didn't haha... From now on, I'll bring it along to keep me out of this hot hot hot and hot and hot hot hot summer!! !